We are very blessed to be able to provide some of the best Dulse Whole Leaf in the world! It's no wonder this is our most popular sea vegetable. 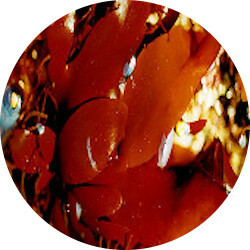 Dulse Whole Leaf are soft and chewy with a distinctive taste and a rich red color. Dulse Whole Leaf don't require any soaking or cooking which makes it a great snack to be enjoyed right out of the bag. Dulse Whole Leaf are a colorful salad ingredient, are tasty in soups and boost the flavor and nutrition of any sandwich creation. And iDulse Whole Leaf are sun-dried so they are totally RAW!